Seems like Jenny McCarthy put her foot in it at the last AutismOne conference. Apparently she divided autism moms into Warrior or Victim categories. I didn’t see her speech, but did see parts of it transcribed. She spoke of moms who are always searching for new treatments for their autistic children—Warrior Moms, and compared them to moms who follow the mainstream philosophy regarding autism treatment. She labeled them “Victim Moms” who love the attention of having an autistic child; clearly not a favorable comparison. I’m going to give Jenny McCarthy the benefit of the doubt because she has done a lot to raise autism awareness, even if her choice of words was insensitive. I think the point she was trying to make is there are a lot of treatments out there for autism, but most doctors simply have no training to know what to look for and how to go about treating autism. And many parents don’t realize their children can get better, their conditions can improve, but they are told by medical doctors there really are no treatments for autism. I’ve been to a few of these no-hope doctors myself…with little to no training in autism, they assume these children bang their heads and assume odd postures simply because they are autistic and that’s just what “they” do—not because there is an underlying cause, often gastrointestinal pain that these children are pitifully trying to cope with, and all too often can’t communicate. For too long children with autism have suffered needlessly because doctors simply pooh-poohed their symptoms. When Ryan was suffering with diarrhea multiple times a day that smelled worse than death and left his bottom red and covered in rash, I was told he had “toddler diarrhea” and “poop stinks”—these so-called medical opinions rendered by physicians. Even when I took him for an evaluation at Kennedy Krieger Institute in Baltimore, I was told by the doctor there not to try any of “those diets” or that “biomedical stuff” and if I spent one dollar, “that dollar should go to ABA”. This was from a doctor who sees autistic kids all the time, who told me he can’t believe the explosion in the number of autistic kids, yet seems to think it’s just a series of neurological coincidences without a medical basis. ABA has worked wonders for Ryan, but then so has treating the myriad of vitamin and mineral deficiencies he has, his anemia, his acute allergies, his oxidative stress and his immune system with that “biomedical stuff”. Stopping his supplements turns this happy, smiling little boy into a miserable and cranky child who has tantrums and zones out. One of “those diets” has all but cured his diarrhea. Incidentally, when I found a doctor in Maryland who knew how to treat autism, he put Ryan through a battery of tests that revealed all sorts of deficiencies that no doctor had previously thought to check. The doctor at Kennedy Krieger (having been sent a courtesy copy of the results) called and expressed some surprise that Ryan had a lot of issues that needed to be treated. I’ll bet he still does not run these tests on the children under his care, even though Ryan’s problems are common in autistic kids. I don’t know if there’s a cure, per se for autism, but I have seen children who have recovered enough to lose their diagnosis and go on to lead productive lives. For some reason making a statement like this is controversial; I assume because for years doctors have said nothing can be done for autism. I can’t blame the average parent who accepts that. Our society has been taught to revere physicians and generally not to question them. I hope more parents with autistic children—and above all, doctors, will keep an open mind about treatment. Actually, I hope more doctors will make the effort to attend an autism conference to learn what the latest research says and what is working. I can promise them they will treat an autistic person at some point in their career. But I digress…I see people who think following a gluten and casein free diet, or using supplements is quackery, or believe because something didn’t work for their child, it is the equivalent of snake oil. Every child with autism is different and might have different metabolic pathways affected. What works for one child may have no effect on another. I know I will never stop looking for ways to help Ryan and children like him. Jenny might have a point, but I don’t think it’s as black and white as warrior-victim, and I think we in the autism community, or those looking in, should be less judgmental and respect one another’s choices. We all love our kids and do what we think is best for them. Warrior or victim? 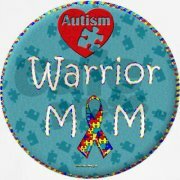 I prefer to think those of us who have autistic children are all warriors, because each of us is fighting the good fight—however we choose to approach it.